Entertainment: Ensure guests enjoy a good time by offering entertainment that is suitable for their personality types. If your guests are more drawn to energetic activities, choose light-hearted, competitive games like charades. For guests who are more laid back, organize classic board games. There are many popular games available in special holiday editions for extra-festive fun. You can also simply play holiday movies and music in the background for crowds that would rather just mingle. Beverages: Stock up on refreshments all ages can enjoy. Keep a kid-friendly favorite like lemonade on hand, and tea is a traditionally well-received option for the grownups. Put a special holiday touch on your drink menu with a recipe like this Holiday Hot Tea featuring Milo’s Famous Sweet Tea, which has been fresh brewed from custom-blended tea leaves with no added acids or preservatives for generations. Favors: Send guests home with a sweet memory of the event, such as an ornament that connects to the party’s theme or a bag of seasonal treats like homemade cookies or candy to nibble on during the trip back home. Simple Snacks: Building your menu around simple snacks and finger foods guests can nibble on while they mingle is perfectly acceptable for almost any type of holiday gathering. Include options that can satisfy all the taste buds. 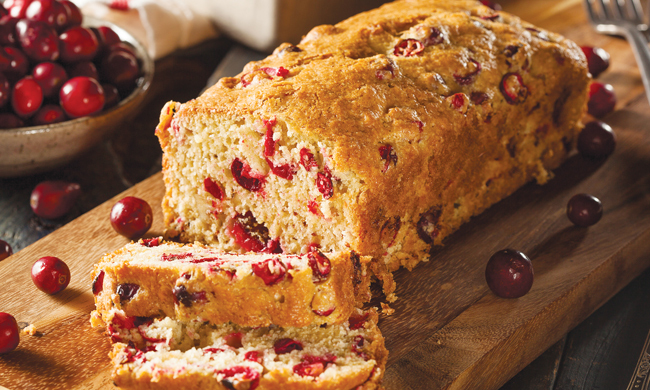 You can even combine sweet and sour with a seasonal crowd-pleaser like this Lemonade Cranberry Orange Bread, which draws its flavor from a secret ingredient: Milo’s All Natural Lemonade. Find more holiday hosting ideas and recipes at drinkmilos.com . In large bowl, mash cranberry sauce into small pieces. Add lemonade, orange zest, vegetable oil and egg; mix until blended. In separate bowl, combine flour, sugar, baking powder, salt and baking soda. Combine wet and dry ingredients; mix until batter is formed. Pour batter into greased loaf pan. Bake 1 hour. Let cool 20 minutes before slicing and serving. In large slow-cooker, combine sweet tea, limeade concentrate, orange slices, cloves, cinnamon sticks, vanilla, cranberries and ginger ale; stir. Heat on high 30 minutes then reduce heat to low for 2 hours, or heat on low 2 hours then reduce setting to warm overnight. Invert moistened glass rims in sugar then fit orange slice over rim, if desired. Note: For easier serving, place cloves in tea ball or double layer of coffee filters sealed with kitchen twine.